The ProSafe FSM726v3 is a 24-port managed switch with auto-sensing 10/100 ports, two 10/100/1000 ports, and two rear stacking ports. This allows fiber connectivity through two hot-swappable small form-factor pluggable (SFP) Gigabit interfaces. This switch's non-blocking design delivers simultaneous, full wire-speed, low-latency throughput to all ports. 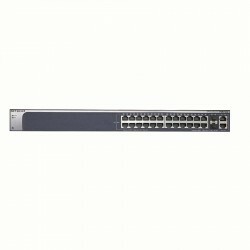 This switch can handle up to 250 users and allows users to utilize up to 12 Gigabit Ethernet ports. 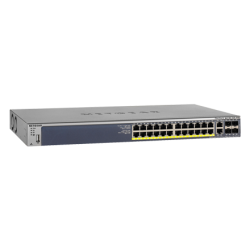 NETGEAR M4300-24X24F Stackable Managed Switch features 48x10G including 24x10GBASE-T and 24xSFP+ Layer 3 (XSM4348S). Part of Netgear's ProSAFE M4300 Intelligent Edge Series, the M4300-24X24F has been designed for mid-enterprise edge and small and medium size business (SMB) core deployments. NETGEAR M4300-28G (GSM4328S) Stackable Managed Switch features 24x1G and 4x10G including 2x10GBASE-T and 2xSFP+ Layer 3. Part of Netgear's ProSAFE M4300 Intelligent Edge Series, the M4300-28G has been designed for mid-enterprise edge and small and medium size business (SMB) core deployments. NETGEAR M4300-52G (GSM4352S) Stackable Managed Switch features 48x1G and 4x10G including 2x10GBASE-T and 2xSFP+ Layer 3. Part of Netgear's ProSAFE M4300 Intelligent Edge Series, the M4300-52G has been designed for mid-enterprise edge and small and medium size business (SMB) core deployments. NETGEAR M4300-28G-PoE+ (550W PSU) (GSM4328PA) Stackable Managed Switch features 24x1G PoE+ and 4x10G including 2x10GBASE-T and 2xSFP+ Layer 3. Part of Netgear's ProSAFE M4300 Intelligent Edge Series, the M4300-28PA has been designed for mid-enterprise edge and small and medium size business (SMB) core deployments. 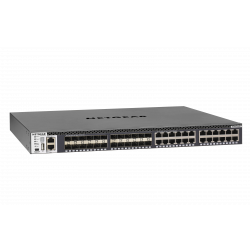 NETGEAR M4300-28G-PoE+ (1,000W PSU) (GSM4328PB) Stackable Managed Switch features 24x1G PoE+ and 4x10G including 2x10GBASE-T and 2xSFP+ Layer 3. Part of Netgear's ProSAFE M4300 Intelligent Edge Series, the M4300-28PB has been designed for mid-enterprise edge and small and medium size business (SMB) core deployments. NETGEAR M4300-52G-PoE+ (550W PSU) (GSM4352PA) Stackable Managed Switch features 48x1G PoE+ and 4x10G including 2x10GBASE-T and 2xSFP+ Layer 3. Part of Netgear's ProSAFE M4300 Intelligent Edge Series, the M4300-52PA has been designed for mid-enterprise edge and small and medium size business (SMB) core deployments. NETGEAR M4300-52G-PoE+ (1,000W PSU) (GSM4352PB) Stackable Managed Switch with 48x1G PoE+ and 4x10G including 2x10GBASE-T and 2xSFP+ Layer 3. Part of Netgear's ProSAFE M4300 Intelligent Edge Series, the M4300-52PB has been designed for mid-enterprise edge and small and medium size business (SMB) core deployments. 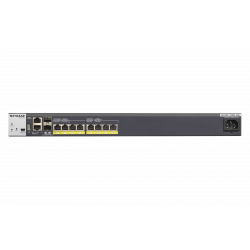 NETGEAR M4200-10MG-PoE+ Multigigabit Managed Switch features 8*2.5G and 2x10G SFP+ Layer 3 (GSM4210P). part of Netgear Prosafe M4200 Intelligent Edge Series has been designed to optimize the installation of Wave 2 11 Access Points. As a cost-effective component of converged voice, video and data networking solutions, NETGEAR M4100 series offers ideal, advanced features for a secure edge in commercial buildings and campus LAN environments. With 26 (10/100/1000) RJ45 Ports and 4 Fiber SPF Ports and RPS power supply.